Curcumin chewing gums could be therapeutically beneficial if used by the head and neck cancer patients. High curcumin loading in chewing gums however is needed to achieve desired therapeutic effect. Preparing gums with high drug load is nonetheless challenging because of the negative impact of solids on their masticatory properties. The use of liquid flavors was found to partially solve this problem. The objectives of this study were to (1) determine the maximum amount of curcumin that can be loaded into co-compressed chewing gums made from Health in Gum® as the base and flavored with 1.5% peppermint oil, (2) determine if addition of sweeteners can improve the yield strength and compressibility of the gums when examined by a texture analyzer, (3) examine the effect of temperature over a storage period of one month on the physical stability of the chewing gums, and (4) study the impact of substituting curcumin with its inclusion complex with SBE-β-CD on drug release. It was found that when flavored, Health in Gum® could load up to 25% curcumin by weight without compromising its masticatory properties. 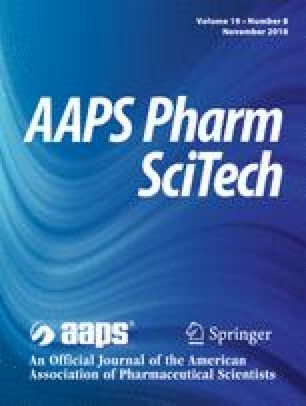 When tested for drug release, SBE-β-CD was found to significantly increase the amount of curcumin dissolved within 30 min. Despite poor drug release from gums loaded with insoluble curcumin, the fragmentation of the gums during mastication by the Erweka tester is nonetheless expected to produce a suspension for absorption in the lower GIT. This study demonstrated how modulating gum composition and storage conditions can impact the mechanical properties of chewing gums with high solids content. The government of Saudi Arabia and Hail University are acknowledged for providing fellowship support to T.A.